If you’ve been following my social media over the course of the past week you will have seen that my very own activewear collection has launched in collaboration with Sports Philosophy (what the heck!?!?). As I am sure you can imagine, this is a super exciting and slightly overwhelming time for me, but I want to share with you guys all about the pieces, how and why I designed them and how you can get your hands on them! The nitty gritty details of how the partnership came about and how we created the piece are covered in my previous blog post. This blog is structured as a Q&A based on the most frequently asked questions I have received! Why are you collaborating with Sports Philosophy on the collection? Firstly, I have known Stella and Matthias (the founders) for a long time, since before they even launched the brand and I have worked with them from the very beginning. I have a lot of loyalty to the brand and a lot of admiration for them for setting up their own company from scratch. However there is also a deeper reason I am working with them. Sports Philosophy are an ethical brand with their own charity, the Freedom for Children Foundation. 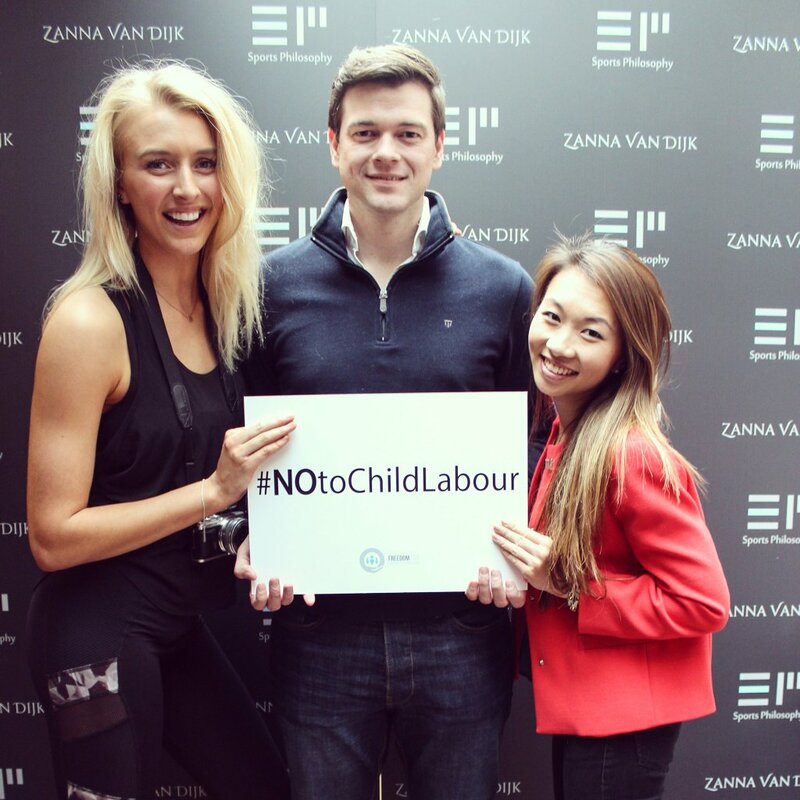 A percentage of the profits from each garment sold by them, including my collection, goes to help raise awareness of child labour issues as well as research and implement projects in communities affected by these problems. Why did you want to design a collection? As someone who wears activewear all day every day, I feel confident in my abilities to design pieces which are not only comfortable, wearable and versatile but flattering and fashionable too. I literally live and breathe fitness and spend 90% of my life in sports bras and leggings (yep, living the dream!). So when I was offered the opportunity to design my own pieces I jumped at the chance. I loved the idea of taking on a new challenge and learning a new skill, and I was excited to create my dream kit! How much were you involved in the development of the collection? I was involved every step of the way. I quite literally designed every element of the pieces. They started out as basic sketches which developed into more complex ones and were eventually transferred to computer programs. Then I helped to produce the measurements, design the patterns and pick the fabrics; then I flew out to Portugal to go through the sampling and prototyping process – working ridiculously long days and nights in the factory. Of course I have Stella and Matthias to thank massively for facilitating all this and guiding me through everything, they are absolutely amazing and know their stuff! Talk us through the pieces? The collection consists of a sports bras and leggings combination which can be worn separately or together. The bra has the perfect padding to give you both a boost and support (trust me, we tried a million and one different pads! ), and these are removable for ladies with bigger busts. It also has a nice thick back to keep you securely held in and avoid that pesky roll of back fat which lots of sports bras give us! Furthermore, it has a cheeky little peek of mesh on the front and panels of a gorgeous monochrome pattern. The leggings are my pride and joy. They have a super high waist to keep you feeling secure and comfortable, and the legs are stretchy so they fit anyone from 5 foot through to 6 foot 2 (I’ve made all my friend try them on, including my boyfriend!). The fabric is incredible quality and it’s thick, meaning it survives the valuable squat test! Of course I have to mention the intricate panel design which took a ridiculously long time to perfect, we spent hours and hours with protractors and rulers! However, it was totally worth it as they look even better than I imagined! Any top tips for sizing? Yes! I find that using someone else for reference really helps with fitting yourself, so I am a size uk 10 with a 32D bust and I wear a size small in both the top and leggings. The small bra will however fit smaller busts i.e. B/C cups. I would always recommend downsizing in activewear rather than upsizing if you’re between the sizes, as it will naturally stretch over time. The sizes go from XXS through to L.
Do you have plans to expand the collection? Not yet. This collection is in essence a tester and an experiment. We wanted to try out designing just two pieces and seeing how they are received, how well they sell and the feedback we get. Of course, if these go down well then I would love to continue to work with Sports Philosophy into the future and produce more activewear pieces! Keep your eyes peeled! The main stockist is Sports Philosophy who ship worldwide! The pieces are also stocked online on Active in Style and Fashercise. In store they are at Lomax gym on Fulham Road and the Active in Style store on Kings Road. Yes! There are two events coming up this weekend relating to the collection. The first is a meet and greet at the Active in Style store and the second is a workout and afternoon tea at Lomax. Come along, say hey and hang out! If you have any more questions then leave them in the comments below and I will get back to you! If you do purchase the pieces then firstly, thank you so much for the support and secondly, please do tag me in any photos and use the hashtag #zvdxsp so I can find your posts!